ObamaCare - Approve or Disapprove? 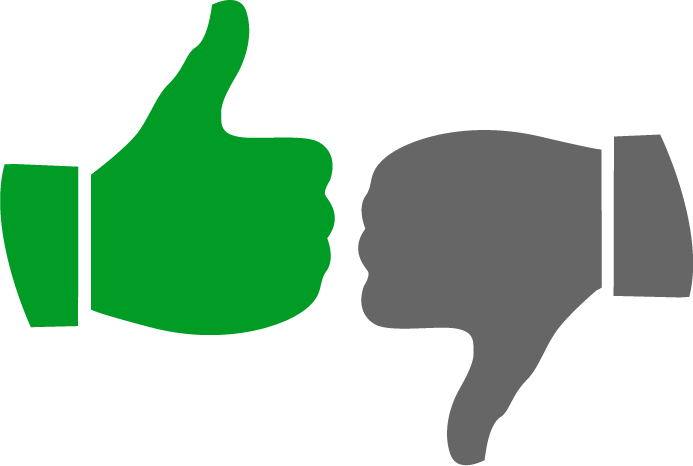 Do you approve or disapprove of the Affordable Care Act (aka ACA or ObamaCare)? In a recent poll, 1,979 registered voters were surveyed about their feelings about ObamaCare, and analyzed by demographics. The Morning Consult National Healthcare Tracking Poll was conducted recently from August 29-31, 2013 from a nationwide sample. Results from the full sample have a margin of error of +/- 2 percent. 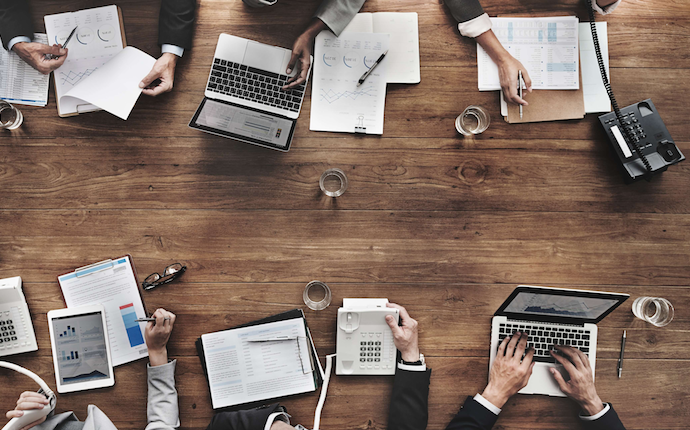 The interviews were conducted online by Survey Sampling International, Inc. and the data were weighted to match a target sample of registered voters based on age, race, gender, education and region. According to the survey, registered voters surveyed disapprove of ObamaCare by a 5% margin -- 49% disapprove of the 2010 national health reform law, 44% approve, and 6% have no opinion. Many opponents of the health reform law say it will be difficult to get young, healthy people to sign up through the exchanges. While this is yet to be seen, the survey shows that older voters are more likely to disapprove of ObamaCare. 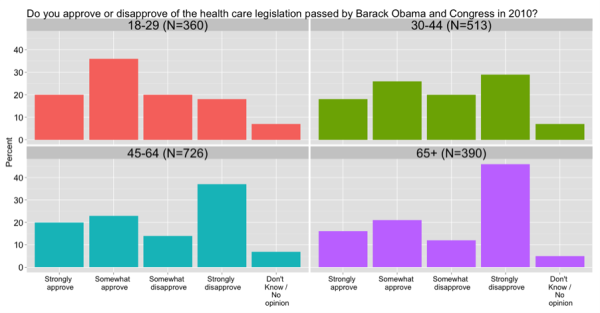 According to the survey, 46% of seniors strongly disapprove of ObamaCare. 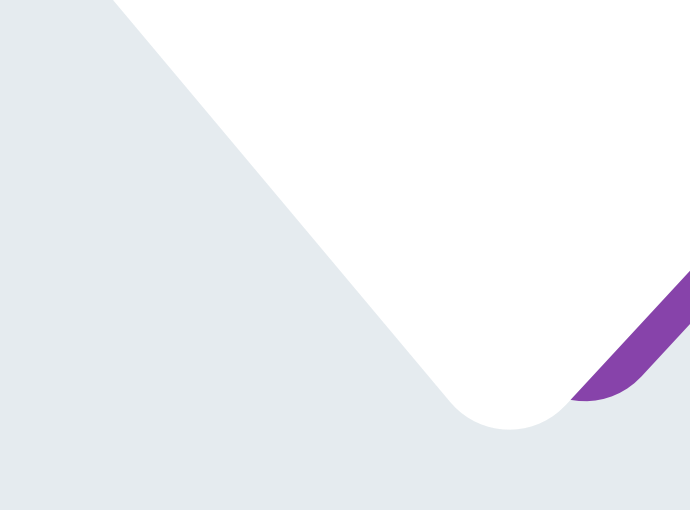 Of adults aged 45-64, 37% strongly disapprove, 29% of adults 30-44 years old strongly disapprove, and of those under 30 years old, only 18% disapprove. According to the survey, females have a slightly higher approval rate. 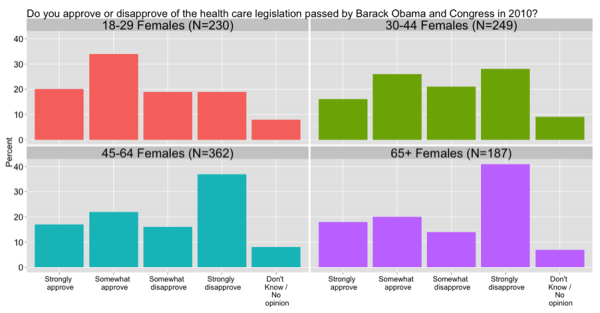 For both males and females, the same age trend applies as above, both younger males and females have a higher approval rate of ObamaCare. According to the survey, less than half of White registered voters approve of the ObamaCare, compared to 57% of Hispanics and 76% of African Americans who approve. 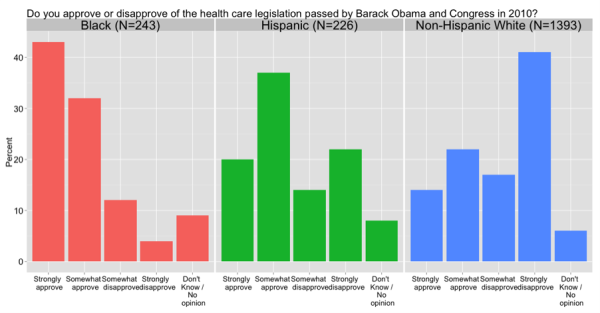 Of the African Americans surveyed, 43% say that they strongly approve ObamaCare. According to the survey, registered voters with less formal education tend to disapprove of ObamaCare. 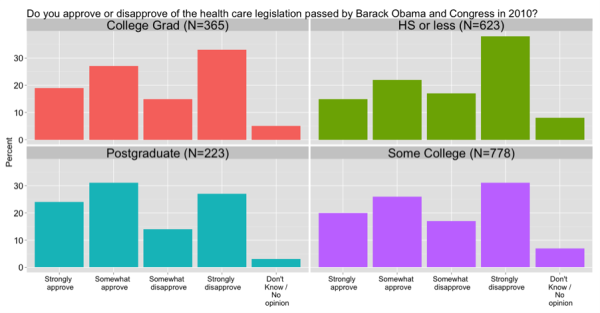 Registered voters with a high school degree or less disapprove of the ObamaCare by a 55-38% margin. Whereas registered voters with a graduate degree favor the health reform by a 55-41% margin. Further, 50% of college grads support ObamaCare, compared to 42% of non-college graduates. 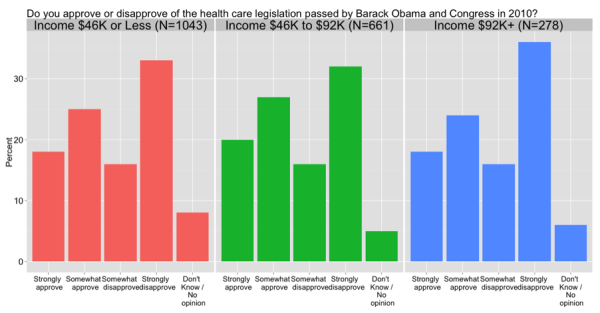 As far as the survey shows, income level is not related to approval or disapproval of ObamaCare. Of regsitered voters earning under $46,000 annually, 43% approve of the health care law, compared to 47% of voters earning between $46,000 and $92,000, and 42% of voters making $92,000 or more. 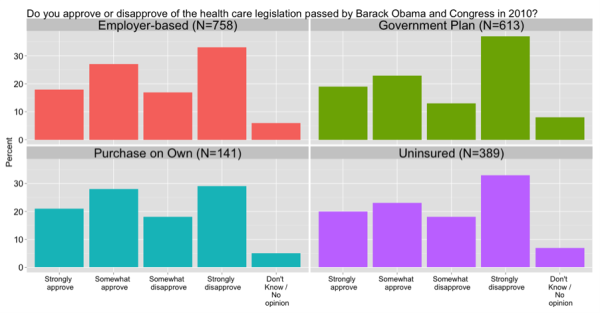 Lastly, the survey found that existing coverage does not affect whether a person approves or disapproves of ObamaCare. 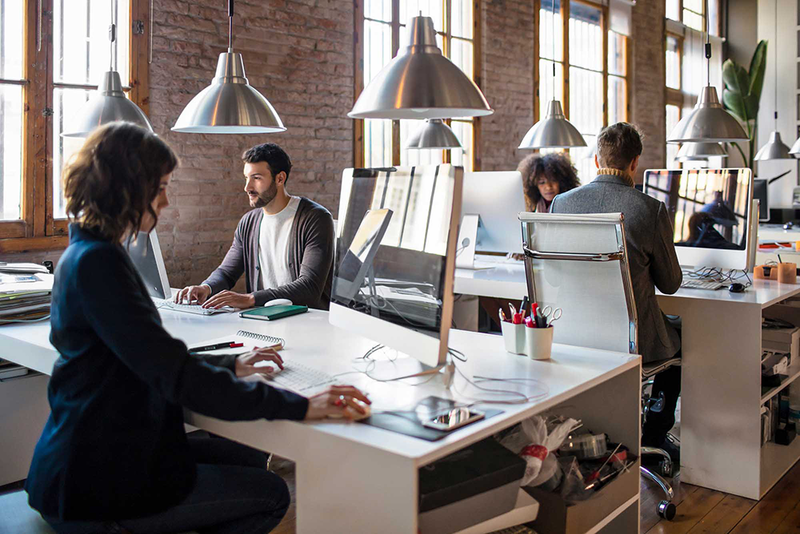 The percentage approval rates didn’t alter significantly whether the person had employer-based coverage, a government plan, individual insurance, or are uninsured. To see the full report: August 2013 Tracking Poll Memo. 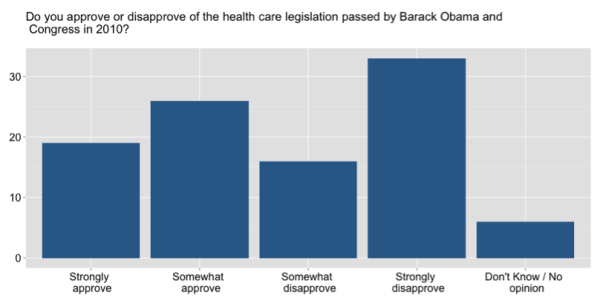 What do you think of these ObamaCare approval and disapproval stats? Leave a comment below.